Maki, Remi and Yuka are three girls on the police force who are about to encounter their most dangerous job yet. Sam McCoy is well known to be be involved trading slave girls, but the police have never been able pin anything on him. That's when the three get involved in a sting operation at one of McCoy's night clubs. Yuka ends up getting kidnapped and time for her is running out once they discover she's a cop. 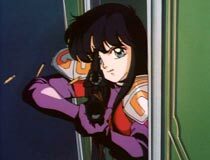 Maki and Remi decide that waiting for authorization isn't going to cut it and that the only solution is to assault McCoy's compound. Can two girls really take on an army of thugs? Given enough weapons... maybe. I watched Burn Up a long time ago but couldn't recall much about it. Watching it again, I now remember why I couldn't remember much: it's because hardly anything happens. 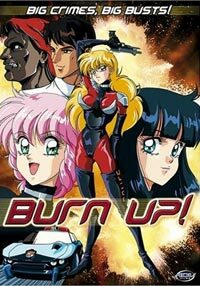 Burn Up is an old school action anime that kinda forgot the story. It starts with a car chase, slides into the setup for taking on crime boss McCoy, and ends with a shoot out at his mansion. 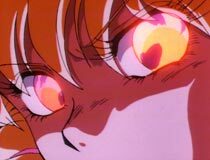 You'd think I was glossing over details or hiding something, but that's really all Burn Up consisted of. At the end I was a bit confused thinking to myself, "wait, that's it?". Thinking of other reasons to watch Burn Up doesn't yield much. The animation is well done, but poorly utilized since very little happens. The (mostly) hard rock soundtrack is kinda cool, which fits the action movie mold. The dub is an early ADV effort and not very good. In summary, Burn Up is worth skipping. It's like the middle of a bigger movie, but no one remembered to fill in the beginning and end. It's hard to believe this launched a franchise. "Girls with guns" is mostly a fluff genre but there needs to be a point. Remi: Ah, young love. How sweet, pure and hormonal.